For decades, scientists have been trying to calculate the approximate time of the Thera (Santorini) volcano eruption that shaped the island and the surrounding geography. A new study measuring annual radiocarbon records concludes that the Santorini volcano erupted after 1600 BC. The finding sheds new light on the long-running debate focused on a discrepancy between radiocarbon (late 17th–early 16th century BC) and archaeological (mid 16th–early 15th century BC) dating evidence for the Santorini volcano eruption, one of the biggest of the last 4,000 years. The estimation of past timelines for human and environmental interaction has been transformed by the development of an internationally agreed radiocarbon calibration curve based on the best available measurements produced from samples with independently calculated or known calendar ages. For the past 12,000 or so years, measurements are mostly derived from consecutive, sometimes overlapping, decadal and semidecadal blocks of known-age tree rings. These determinations are then drawn together to form a single calibration curve against which new measurements on a range of carbon-based materials can be compared. For the new study published in Science Advances magazine, American and Irish scientists measured single tree rings of known age from high-altitude bristlecone pine from the White Mountains of California as well as low-altitude oak from County Kildare, Ireland. Then they compared these measurements with previous curves. While previous data showed that the Thera volcano erupted between 1627 and 1600 BC — with most probable years 1614 and 1613 — the new study places the eruption after 1600 BC. If the data of the new tree-ring study is accurate, this would be the first time scientists and archaeologists agree, as the latter estimated a later date for the eruption. The American-Irish research places the occurrence between 1600 and 1525 BC. This period overlaps with the historical-archaeological estimates that the explosion occurred between 1570 and 1500 BC, that was based on written texts in Egypt, ceramics from excavations and other archaeological findings. 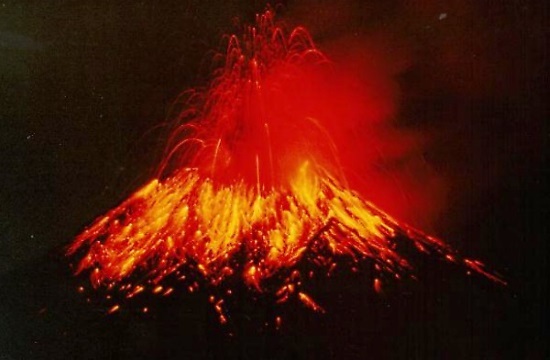 The huge eruption of the Thera volcano is believed to have catapulted so much material in the atmosphere that it cooled the whole earth for a while. That would have a negative effect on the tree rings, even distant trees, making them look that they belong to a cooler climate. This was what the researchers found in four separate tree rings of four different years, leading them to their new assessments of the Minoan era eruption. The dating of the Thera eruption can create a chronology for early Egypt, Greece, Turkey and the rest of the Mediterranean at such a crucial turning point of the ancient world, the study shows. This is the first time that the radioactive carbon study results are compatible with the archaeological evidence of the 16th century Thera eruption.